WAFFLES: Hey, Boss! Lookee who came to Glogirly's birthday party! KATIE: I don't think those are party guests, Waffles. WAFFLES: So if they're not guests, I can eat them, right? KATIE: No, you can't eat them. They're prizes for our Birthday Giveaway. WAFFLES: We're giving away a birthday? COOL! Glogirly said she didn't want her birthday this year on account of there being so many candles and all. And there's a fire ban in the mountains. KATIE: You can't give away a birthday, Waffles. KATIE: Yeah, that's not really how it works. Yesterday was our girl's birthday so we decided to celebrate with our favorite kind of giveaway. 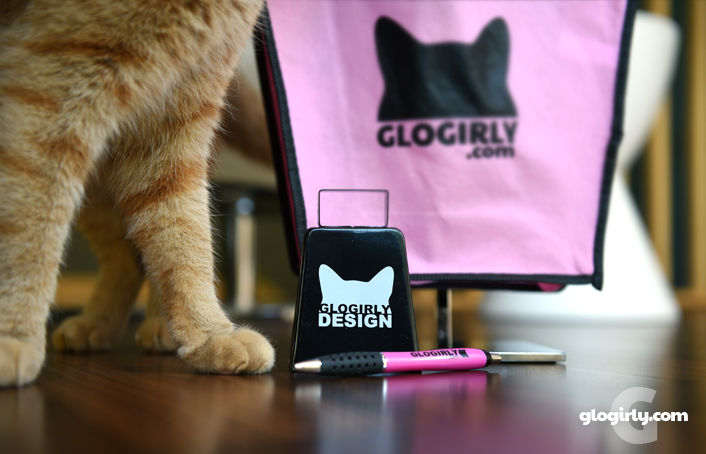 What could be more fun and pink than a bunch of cool GLOGIRLY swag??? Each time we've shared photos of our swag on Facebook, or hosted a giveaway of the coveted pink stuff, SO many of our friends and readers have wanted to know how to get their paws on some of their own. We still have a tiny stash we've been saving for just the right occasion. And today's the day! Just the right size for lunch, snacks.... or half of Waffles. Because sometimes you just need more catbell. 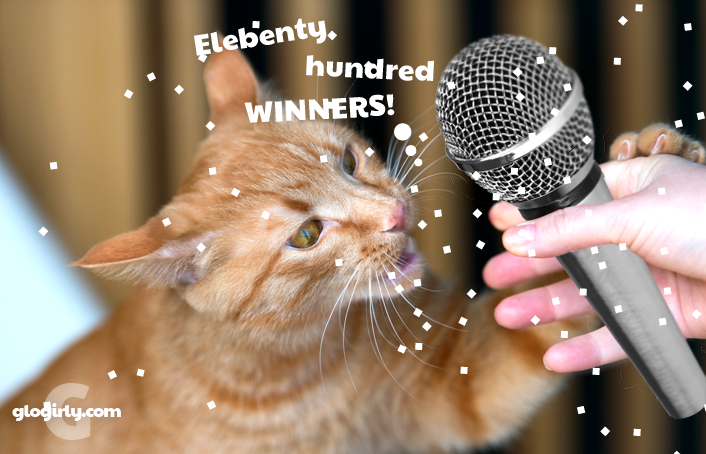 Each winner will also receive a catnip mouse in their swag bag. Either Cotton Candy Pink Miss Mouse or Mr. Chocolate Mousse Mouse. Wait? No one commented yet? OK We had better get busy! Happy Birthday! The comments on my computer did not work for some reason. Sure get a kick out of these two fur balls. Happy birthday Glogirly! I hope the kitties gave you extra head bonks! First of all, Happy Birthday to Glogirly. I totally understand wanting to give a few birthdays away. This year was a BIG one for me. I wish I could start counting backwards from this point. I'd love the swag for myself and we currently have FIVE kitties who would love the catnip mouse! The last daughter still living at home was supposed to be moving in with her boyfriend, but he found bedbugs at the apartment he moved into and moved out immediately - and into our house (for now). There has been a little stress between the cats, plus of course the two guest kitties just had to deal with not just one, but TWO moves (after having moved less than a year before this to bigger apartment where the boyfriend used to live). Yep, anything that gets their attention and keeps them happy - and hopefully interacting with the other cats - is always welcome. Well, I'm not sure just how old Glogirly is, but she doesn't look a day over 21. LOL! Happy birthday to your human! My human's birthday is on Caturday, and we're hiding in an undisclosed location in hopes of avoiding it. Has the Bestest Birthday ever!! Bon lendemain de fête (Happy day after birthday) ! 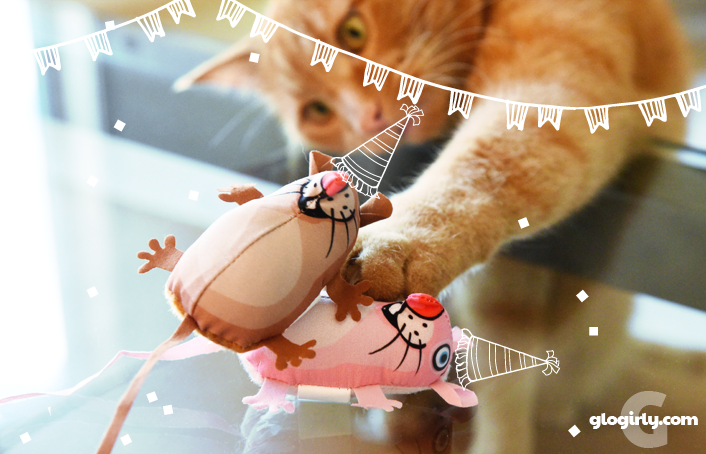 Parker would probably prefer the pink catnip mouse if the Rafflecopter says we win. It matches her nose, her collar, and one toe per paw. Your cats are so cute! Happy Birthday to your kitty and I love cats! Mine is a cutie pie also! I bet this will be a very popular giveaway! Happy birthday. Happy birthday! Mama says Ham can't have catnip, so we aren't entering but we wanted to wish everyone good luck and wish Glogirly a Happy Birthday! 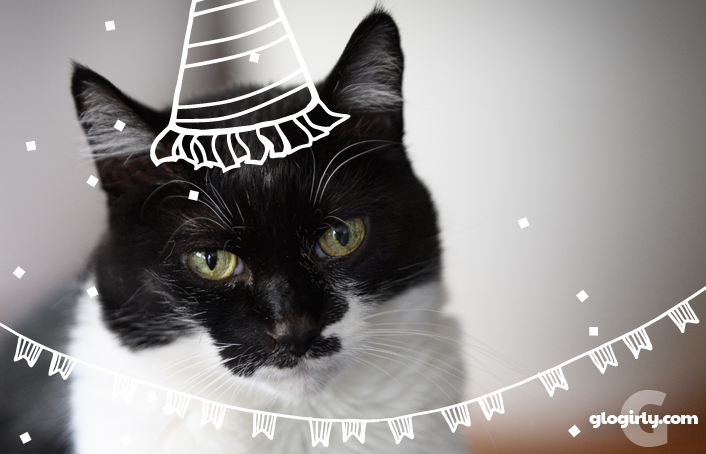 We all hope you had a great purr-thday! Because some of us were rescued, our exact birthdays are unknown, but we estimate that Manhattan and Lulu were born in late June/early July, so Z-girl just says July. We also acknowledge Bessie's birthday this month because that's when Bessie and Lulu were rescued (Lulu was a teeny little kitten!!! )...so we are adding you to the list of reasons to celebrate in July, Glogirly!! May you have some delicious desserts, a beautiful view of the mountains and feel the love that abounds! I LOVE my Glogirly fix every other day. Great pics, fun stories. You are a delight, Debbie. And Katie and Waffles are so cute and fun . . . and funny. Wonderful blog by a wonderful "girly"! Happy Birthday! Oh, pawsome. The catnip mousies especially look interesting. Happy birthday, Glogirly! 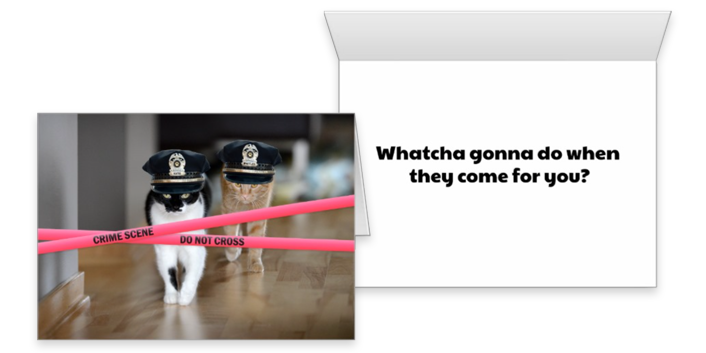 I love to get my new emails telling me that Waffles and Katie are up to new hijinks!!! I love Glogirly, Gloman, and the fur babies!!! Happy birthday Debbie!!! Hope you had/have a wonderful day. 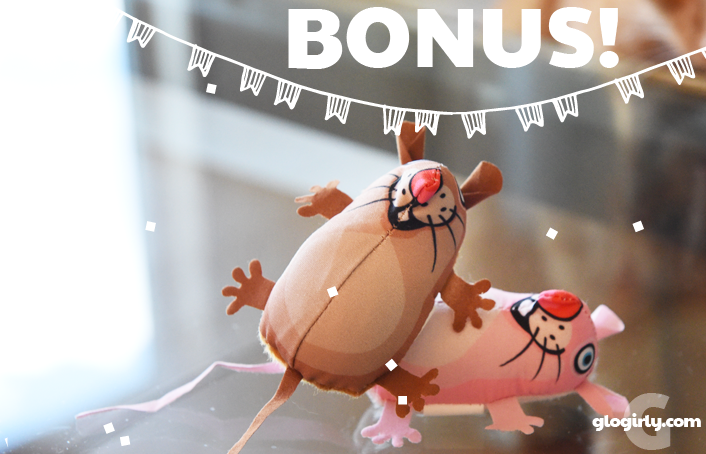 Love the birthday hats on the mice toys' pics. So what did Katie and Waffles get you for your birthday? Pekoe is asking if he can have a playdate with Waffles if we win! Some great loot! Hope you had a fun birthday; looks like at least Waffles had a lot of fun, but he's always having fun! Happy Birthday to Glogirly, If we should win could you include some nice cool mountain air please, it's like a furnace here today. What a way to celebrate! Happy Birthday (belatedly) to Glogirly! Happy birthday Glogirly! Hope your birthday was extra special! my kitties birthday is in July also. So nice of you to share your gifts! Happy Birthday Glogirly. We love your competition. I've replaced birthdays with anniversaries of my 30th birthday . I hope you had a great one! Happy birthday, Glogirly! We hope your birthday was super special (like you)! Wishing a very happy birthday!! Happy Birthday!!! Here's to many, many more. Hope you had a awesome evening with the kitties and at least got to talk to Gloman on your birthday. Again Happy Birthday! I would Absalutley love to win this! Happy Birthday all month long..